Khushi Raj from Begusarai, BHM Graduate. MS OFFICE AND INTER.. OPERATION MANG..
are one of expert skill area's of Khushi Raj . 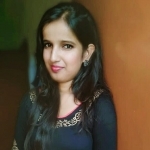 Khushi Raj is working in IT Software industry.